I didn't feel up to it. I'd had a long night at work. It left me wondering why I only ever get to go out to the plane when there's a problem that's not actually there, that we need to sit and try and duplicate for the entire shift. Oh, and why I always get broken ground support equipment. That wastes a few hours. Chris challenged me earlier tonight when he told me about my last post. "If you keep this up," he remarked, "you'll have that entire John Stewart story up on your blog with a seven hundred word interpretation of each panel." "I could easily do that," I answered, "but I'm not really so bad. For example, I can post the third panel tonight with just the sentence 'Never, ever say this to a cop.'" And I fully intended to do exactly that. Until I pulled the panel up and saw it separated from the rest of the story. Then I noticed the threatening posture of the cop, and the size-proximity trick Adams does here, and the shadow falling on John's face. All tricks to make John seem more vulnerable in this situation, and emphasize his courage. There's also some trick with the emotions going on here. The background is suddenly stark white with blue word balloons. Having the word balloons darker than the picture here adds extra emphasize to the word. Tension is building, emotions are running high. With all those beautiful techniques, who could simply go for the cop joke? I used to just go by the general feeling of an artist. I liked a certain soft cheesecake style, and took little interest outside of it. I grew to appreciate the non-traditional types, because a talent for fluid motion would catch my eyes, or an expressiveness in the characters. Now I'm becoming obsessed for the first time with artistic symbolism. I love it. So much can be conveyed with a few small shortcuts. It's amazing, and, like the writers, I'm not sure the artists realize they are doing this. I think I may be infatuated with this penciller. I can't stop thinking his panels. His gorgeous, shadowy, symbolic panels. Fortunately for me, I have no address for my embarrassing love letters, so I'll be spared the same humiliation I felt when I realized how much time I'd wasted writing to that kid on Seaquest in elementary school. Unfortunately for you, dear readers, it means I'll be using this blog as an outlet for my insane ramblings about this story until I find something else to distract me. If I don't see this distraction today, I'd like to apologize in advance. This could get a lot worse before it gets better. I wasn't going to keep doing this, but the yellow background is nagging at me. Anywhere else, I'd accept that it's a random color. But this is a panel found in Green Lantern. For 30 years, this was the sole weakness of Green Lantern. Their powers were unable to affect anything yellow (Please note the date on that linked post). Yellow is not cavalierly thrown around in this franchise. It's usually there as a means of hurting the main character. It's been there as a mistake, which made Superfriends interesting ("Everytime Green Lantern's ring affects yellow, take a shot"). Sometimes, though, its symbolic. It's the color of the ground on an alien planet, the background of choice for a villain, or the color of an ex-girlfriend's scarf. It can be representative of limitations, weaknesses, vulnerabilities, restrictions, or fears. This is the first time we get to see John. He is about to be inducted into the Green Lantern Corps, and he is surrounded by yellow. I'm not sure what to make of it. 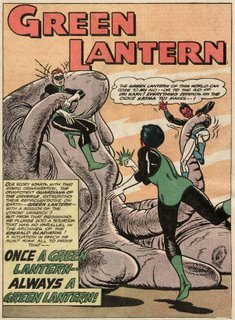 I find it hard to believe that, for a new Lantern's first appearance, they would just arbitrarily pick a "Yellow Background." This is the second panel of the page. Right away, any comic book reader knows to chuck the standard superhero image out the door in this setup. The standard would have shown up in the first panel, because why create even minor suspense for what's expected anyway? For a huge surprise, someone we've seen before and have reason not to expect, it's traditional to make the reader turn the page. Here, it's just a panel. O'Neil held off just long enough so that we'd pause and think about what we read and saw before we actually see the new guy. This is a new personed, but this will not be someone like Hal. Most likely, judging by the language of the first panel, this will be someone at odds with Hal. I think the intended effect of that pause is lost on today's readers. We don't really have a good representation of the American population in regular DC comics yet, but it's a lot better than back then. At this point in time, 1972, it was probably unheard of to bring in a different race as a replacement. So, even with the previous panel, a reader was probably expecting a white man, even with second panel introduction. Probably an activist who'd be at odds with Green Lantern like Green Arrow was, but still with a certain look. There's not much extra in the panel, they didn't want us to get distracted from John himself. We do learn a lot about him in the first glimpse. Nevertheless, we can learn quit a bit about the man here. We learn he's a sarcastic smartass who doesn't automatically grant his respect to a scary uniform by his words alone. His sneer and the tilt of his head add a condescending dismissal to this. He's man enough to wear pink. 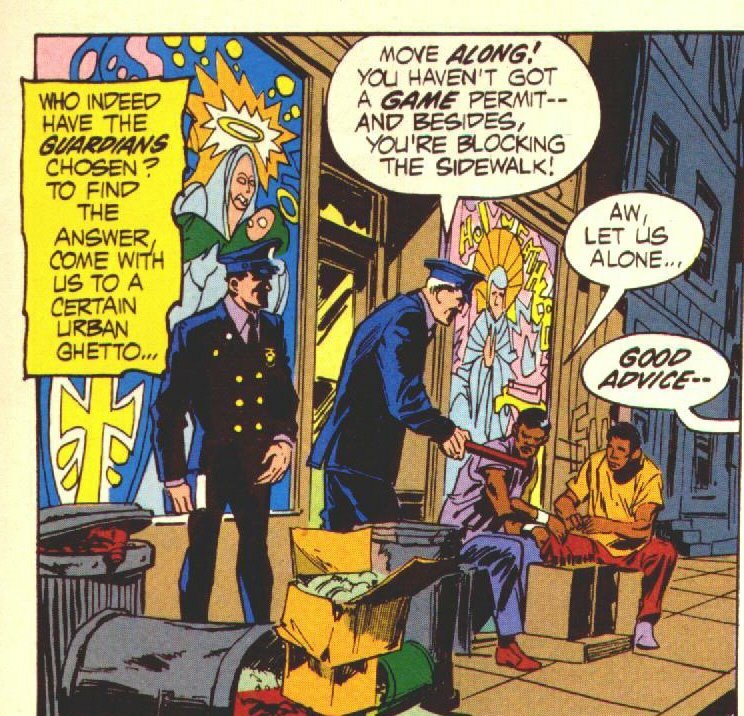 He's got a sense of fairness, justice and the courage to step in when he sees an authority figure abusing their authority (again, refer back to the first panel, the sidewalk is not being blocked). Even when he is in all likelihood about to get in severe trouble for it. I can see how Katma Tui, a native of Korugar from when it was under Sinestro's Totalitarian Regime, would be so much more attacted to John than Hal. Hal's a "work with the system" type, his courage is physical. John's social courage is so much more impressive to a woman of Kat's background. Yet, the yellow background still eludes me. Does it mean that he's leaving restrictions and limitations behind him now? Or does it represent a certain fear that accompanies his actions? He's doing a very brave, but very stupid thing here when he comes up behind a cop who's abusing his authority. Does the yellow in the background subtly tell us that John recognizes his actions, knows the consequences, and is leaving his fears behind him? It could simply be foreshadowing the rocky start to his relationship with Hal. They start off fine as trainer and trainee, but there's a barrier created by unspoken feelings. The obvious cause for the barrier (particularly in this run of Green Lantern) is prejudice. I picked up this story expecting an After School Special about racism. But that level of characterization is actually quite subtle. It exists, and surfaces, but there is a much more overt character conflict that causes the barrier. Hal and John have separate values. Hal's worship of Authority is well-established by this point in O'Neil's run. 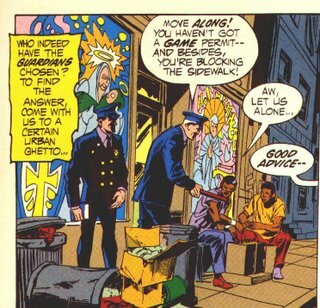 John's attitude towards authority is immediately established in this panel. Hal is placed in authority over John as his trainer, and Hal is witnessing this scene as his first impression of John. Ther judgement is there on both appearance and character. The racial prejudice is a much more obvious problem. It's something both men want to avoid, they don't want to confront this attitude. As a result, the major disagreement, the dissenting values, goes unexplored and unresolved. This creates an undercurrent of tension between the two that lasts much of the John's initial training, until the plot of the story interferes and forces both conflicts to the surface. Because most of the barrier on Hal's side is caused by this first impression, it's very sensible to introduce John surrounded by a color that presents a barrier to Hal's powers. I found the debut story Katma Tui, the first female Green Lantern. Published way back in 1964, in the back of Green Lantern #30. Here's the title page. It has a significance that my regular readers will understand instantly. Guy Gardner: Warrior was a weird comic. Some of the plotlines included extras like the main character finding out that he's an alien-human hybrid and the last of an almost extinct species, the main character speaking the dialect of a Norse Demi-goddess that he used to date, random Lobo appearances, physical trips to Guy's subconscious, a Restaurant premier attended by every superhero in the DCU, hand-to-hand combat with Parallax, and involuntary gender-bending to say the least. Should a fantasy sequence ever call for her to strike such a pose, she should stop immediately beforehand and apologize. "I'm sorry, I just can't do it. It's just not me." It will be okay, she can take the paycut. Have Donna Troy stand in. This picture is at odds with every know character trait of the Amazon Princess. It's jarring. That pose and that character simply do not belong together in a sane universe. Actually, it's even beyond Alternate Reality strangeness. That pose and that character simply do not belong together. My mind will not accept this picture. My eyes slide off the page and the image leaks out of the back of my head. Each time I look at it, I am traumatized anew because I was unable to log the image in my memory. I got my hands on the first John Stewart story -- Green Lantern #87 (Volume 2). To be honest I was expecting to hate it, but I wanted too badly to see John's creation. I think my low expectations may have been because of Winick's heavy-handed run on Green Lantern, but that's enough material for a whole other post. Instead, I'm going to show first panel of the first page that featured John, and share two thoughts about it. Notice the word Guardians is in strong text. 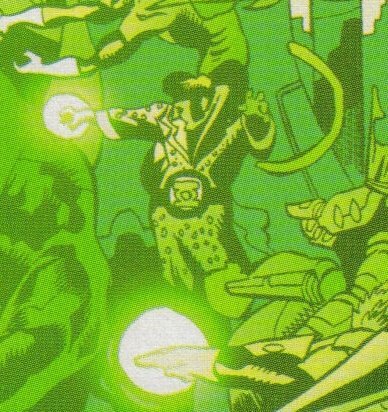 Hal and Guy were both chosen by a desperate dying Green Lantern. So was Sinestro. John is the first character personally selected by the Guardians. The intention may have been to show that this was standard practice, but it's the first time we've seen it. I think this was a subtle characterization fo Hal. O'Neil essentially said that Hal would never have picked Hohn, even if the ring outright told him that john was the best choice. The higher-ups had to specifically step in and tell him "You will train this man." 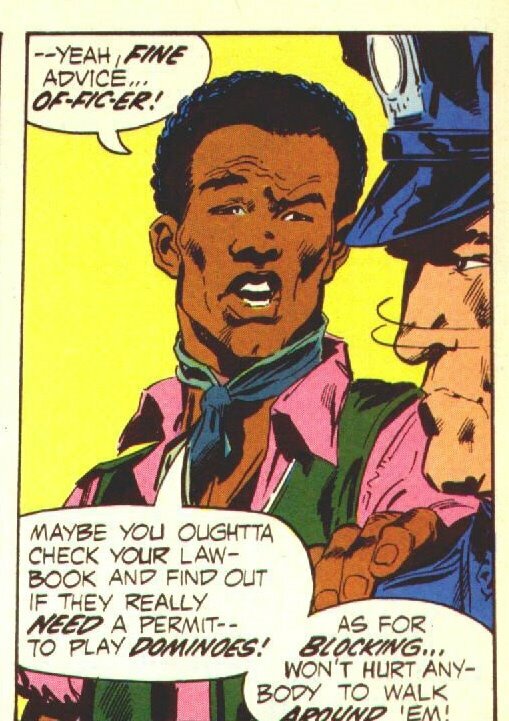 I like how Adams subtly characterizes the "Good Cop" in this panel. He positions him directly beneath the halo. He's standing up straight, standing back from the wrong that's occuring and holding a book that resembles a Bible. Meanwhile, the "Bad Cop"stands on a darkened doorstop and shakes his weapon threateningly. These characters only appear for half a page, but he sets up the basic personalities very clearly. Finally, I may be stretching a bit here, but it's funny that John's first words in print are "Good Advice." 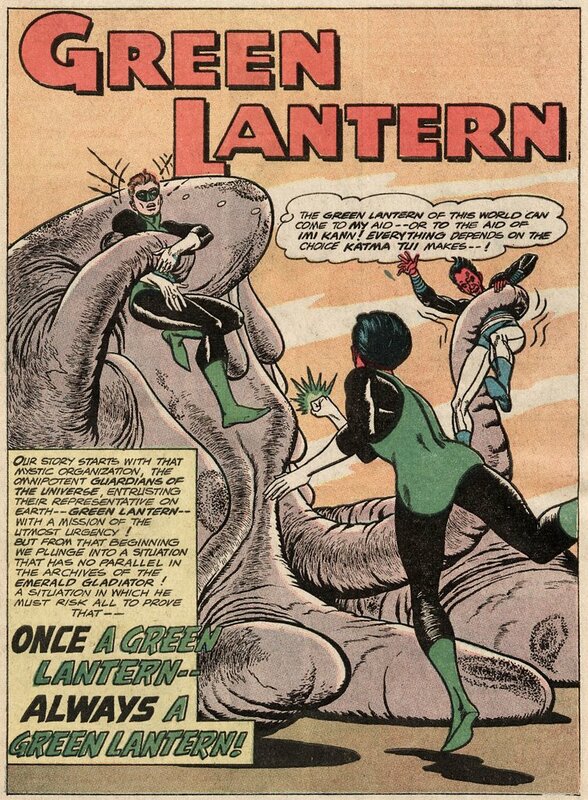 This is pretty much the role John plays as a Lantern now. He gives good advice. He was basically a mentor and advisor during Kyle's tenure. Now that he's back to active duty, John still only appears in the advisor role. He relays information from other heroes and spouts exposition to Hal, who then goes and deals with the action. Hell, even in Mosaic John's personal story, John was there in an advisory capacity. He was there to try and get everyone to learn to communicate and live together, and keep problems under wraps -- but all John could really do was advise. The communication and learning of the Mosaic was in the hands of the residents. This may be because, from the very start, John tends to be portrayed as more intelligent, stable and thoughtful than the characters around him. He's generally not the person in need of advice, so writers use him to give it to the other characters. This probably contributes to his being shoved into the background.